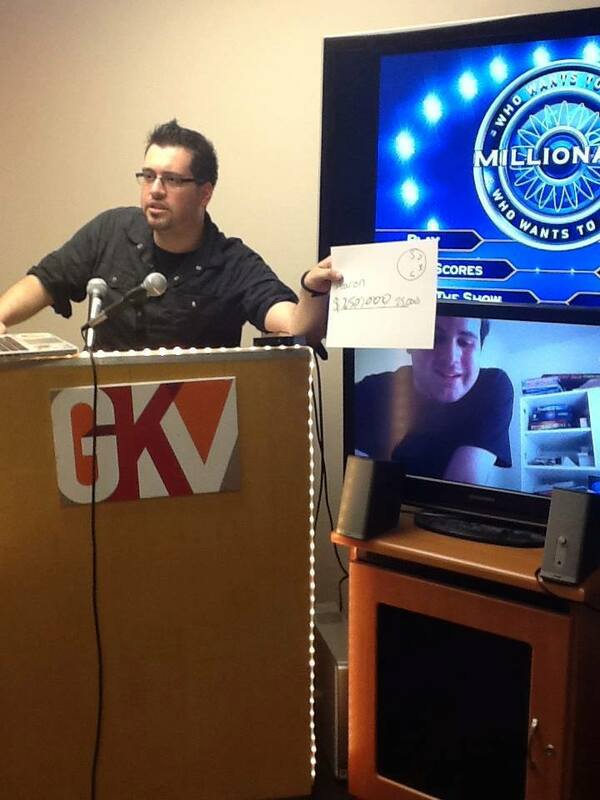 In this edition of Throwback Thursday, Christian Carrion takes a look at the origins of the world’s first online game show endurance marathon. Okay, so this is how it all started. In 2012, I was a broadcast journalism major at Southern Connecticut State University. 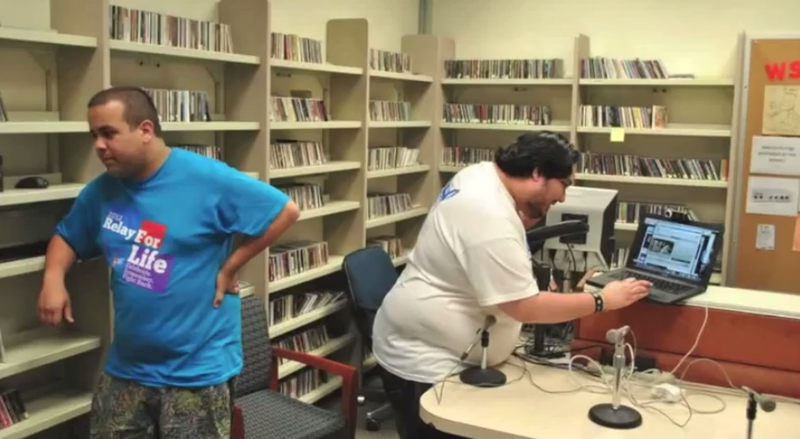 When I wasn’t burying my ledes or wrapping my packages, I split the rest of my time between working as a lab assistant at one of the school’s computer labs for students with disabilities and serving as the general manager of WSIN 1590 AM, the school’s radio station. Needless to say, I was a pretty busy guy. My shifts at the lab were usually my homework time; when I wasn’t helping students with homework or printer issues, I was banging out articles and essays while jamming out to Evelyn “Champagne” King and chilling on Facebook. So it’s some day in March, and I’m doing some homework, right? I get a message from my buddy Cory Anotado. It’s a YouTube link, with an accompanying message: “This seems like something you would do.” The video was a promo for a BBC broadcast called 24 Hour Panel People. Comedian David Walliams, who previously had swum the English Channel and Strait of Gibraltar and cycled from one end of the UK to the other, was the star of this day-long charity broadcast that saw him take part in 24 different panel games, from Just A Minute to QI to Blankety Blank to Call My Bluff. The show was part of BBC’s Red Nose Day festivities, wherein they raised money for the charity Comic Relief. Well, I watched it, and I was instantly intrigued. I had been trying to figure out a way to incorporate my love of game shows into something that could happen at the radio station I was in charge of, and this seemed just unique and outlandish enough to work. 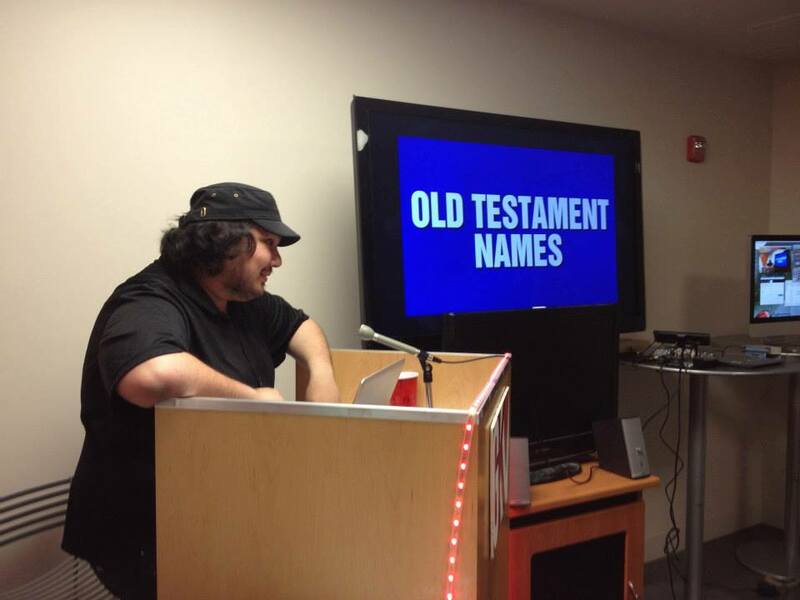 I had about 200 different game show-based board games we could harvest material from, and Cory, the Flash programming wizard that he is, could whip up some broadcast-friendly game controls with ease. My plan was simple: pick a bunch of games I own the corresponding home versions of, open them up and grab all their questions or puzzles, load them into Cory’s software, and off we go. 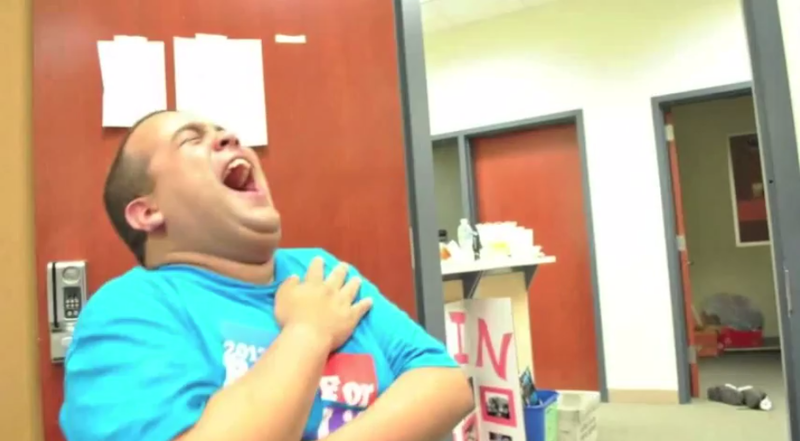 Then I looked at the calendar. The American Cancer Society’s Relay For Life was coming up. Boom, there’s our charity. All of the elements involved came together almost like magic, and within the span of about 30 minutes, planning for the 24-Hour Game Show Marathon had begun. Soon after, we got our friend Bob Hagh involved. Bob and I have been close for quite a long time; we met in 2006 at an audition for Million Dollar Password in which we played together. Bob was going to Southern at that time, and he was also involved with WSIN (his version of Deal Or No Deal is the stuff of legend). In 2009, when I began attending Southern, Bob got me into the radio station, where I met a lot of friends I remain close with to this day. Therefore, it was a no-brainer to get Bob, who had recently graduated, involved in this marathon. The next few weeks were chock-full of planning, plotting and writing as we prepared for the big day—Bob and Cory did most of the heavy lifting with regard to graphics and programming, and I did a great deal of the writing. We got nothing but support that first year. 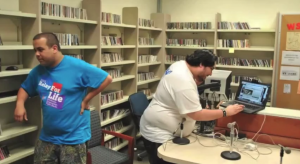 The campus was alive with excitement, and the radio station had never been more popular. The school’s Relay For Life board was also extremely supportive, having donated boxes upon boxes of T-shirts, mugs, and other cute little things to give away. Soon, word of the event spread to message boards like the Invision Game Show Forum and Golden-Road.net (who, if I remember correctly, were a little annoyed that we weren’t playing The Price Is Right). 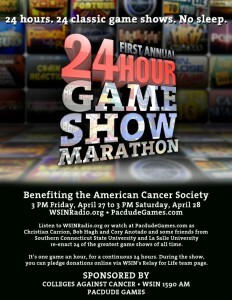 Messages of support and donations to the American Cancer Society began to pour in from game show fans all over the world. Our donation goal that first year was $1,000, an amount we easily surpassed before the marathon even started. The night before the marathon, Cory made the trip from Baltimore to my home in West Haven, CT to rest up for the evening. 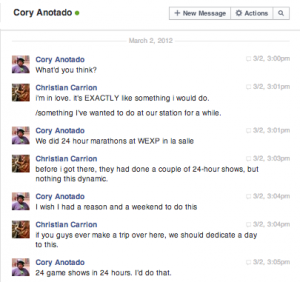 This was actually the first time I had ever met Cory in person, and we hit it off immediately. We became good friends just in time for me to help him inflate his air mattress, which took up the entire floor of my bedroom. That night, we worked like crazy editing our questions and scripts. The air was thick with excitement—the most important sleep we would ever get was only a couple of hours away. The first marathon started on Friday, April 27, 2012 in Room 210A of the Michael J. Adanti Student Center, the main studio of WSIN. The place was no bigger than a bedroom; it was even smaller if one took into consideration the huge desk and mixing board in the center of the room. Other than my board games, our equipment for the show included a 30″ HD TV connected to two PCs, as well as a black MacBook equipped with CamTwist which we used to broadcast the entire event on UStream. We also had a room filled with energy drinks, sugar-free cookies, pretzels, soda, and pillows in case anybody wanted a nap—after all, Cory, Bob and I would be taking turns hosting all these games. The week before showtime, I took a trip to the thrift store and found a teapot to give to the winner of Countdown, as well as a crystal bowl for the Mastermind champion (I ended up just winning them back, but whatever). On our way to the school, Cory and I also picked up a little cake for Bob; it was his birthday, that scamp. The first marathon went off without a hitch, and it was as exciting as we had envisioned it would be. 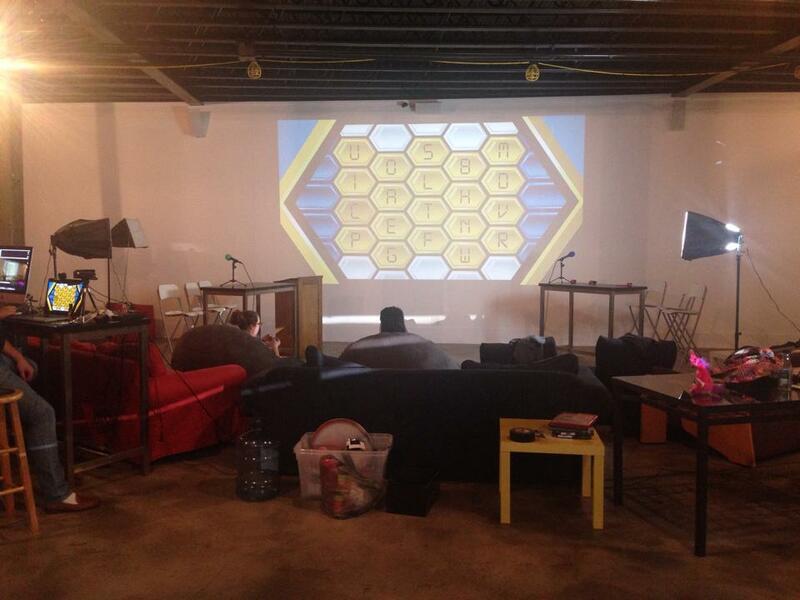 Throughout the 24-hour period, dozens of our friends came to the studio to try their hands at one of the games. Physically, the structure we had planned didn’t hold up much; eventually, everybody just sat where they were most comfortable and we played the games from there. Donations kept pouring in for the American Cancer Society, and for us as well—Bob’s sweetheart of a mom had Domino’s Pizza delivered to the studio, and one gentleman from Australia even dropped some food money into Cory’s PayPal account so we could have some hot food for the night. Altogether, the show was a success on all fronts, and I was hit with a weird sort of sadness when it ended. In the following weeks, I found myself actually missing the anticipation and planning. I knew we had to do it again. And we did. 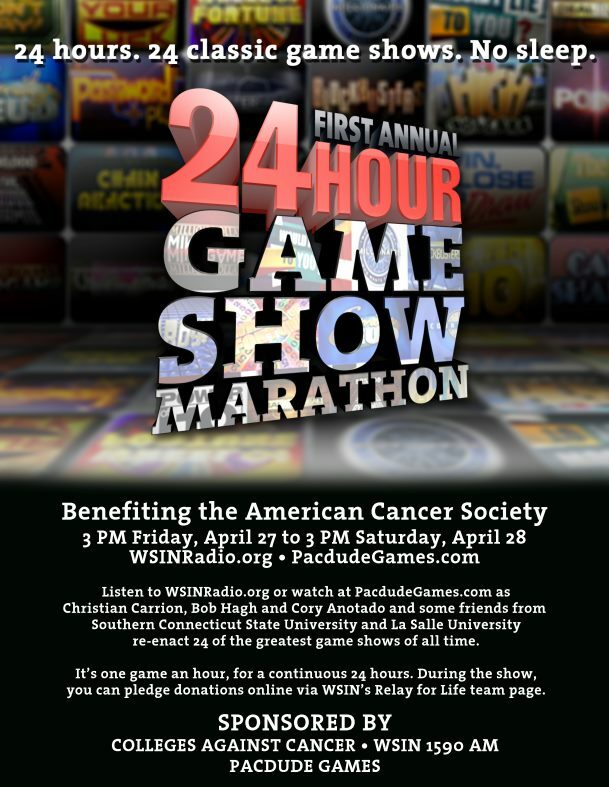 The 24-Hour Game Show Marathon has become an annual event that is always eagerly anticipated by the game show fan community. In 2013, we took the show to Baltimore. This past May, with the help of Newgrounds.com, we were able to broadcast live from their huge warehouse. Altogether, we’ve raised over $10,000 for several charities, played over five dozen different game shows, and met countless new friends. Cory’s been profiled by an NPR station in Baltimore, Bob appeared in a newspaper in his new home state of North Carolina, and I’ve been interviewed by the Fox station and local newspaper in Connecticut, as well as publications and radio stations in Pennsylvania, where I live now. What started as idle chat on my lunch break became something much more than that. I’d like to think our efforts have helped to brighten the life of at least one sick person in the world; I hope they have. I’d like to close with a thought I had a few weeks ago, after the latest marathon concluded. You know, everything I’ve done in my life has been with the intention of having it all build up to my lifelong dream of being a game show host. That’s been my goal since day one. But ever since this Marathon thing started kicking off and becoming something rather significant, I’ve been wondering if I might have been thinking of that goal the wrong way all this time. Maybe it won’t be on The Price Is Right or Wheel Of Fortune right away. Maybe it’ll be online. And maybe I’ll be doing it with my friends. And maybe we’ll be doing it by ourselves in a one-room studio. And maybe our friends will be the contestants. And maybe we’ll be doing it for charity. And maybe that’ll be all right.